State House, Freetown, Friday 15 February 2019 – His Excellency President Julius Maada Bio has officially commissioned thirty garbage collection trucks, a generous grant from the People’s Republic of China, to assist in the government’s ongoing cleaning exercise across the country. At a well-attended event at State House, President Bio said he was grateful to the Government of the People’s Republic of China for the support. He said the valuable strategic partnership continued to reinforce the strong ties of friendship between the two countries, adding that the intervention by the Chinese Government would help his Government deal with the critical issue of solid waste collection and management, especially in the urban settings. He recalled that one of the very first directives of his Government had required citizens to use part of the first Saturday of each month to clean their immediate environs. He said they had recognised that the past government had never bothered to put in place a functional and effective waste management policy, especially for urban areas, and also noted that the uncontrolled dumping of garbage in living spaces with no planned manner of collection and disposal had been associated, for years, with increased disease outbreaks and deaths. President Bio also mentioned that the thirty garbage collection trucks would help the government and the people of Sierra Leone plan for and implement a sustainable waste collection and management plan, while it would also reduce the human health and environmental impacts of indiscriminate waste dumping in living spaces. “In response to my Government’s appeal, the Government of the People’s Republic of China offered a grant of $1.5 million for garbage collection trucks in order to mitigate the real problem of urban waste management. The garbage collection trucks were bought and shipped to Sierra Leone by the Government of the People’s Republic of China. Through an MOU signed, the Government of the People’s Republic of China will be responsible for the maintenance of the garbage collection trucks for two years. “The Government of Sierra Leone has taken up the responsibility to pay all freight clearance charges for the trucks, spare parts, and all related equipment from the Quay. The Ministry of Local Government and Rural Affairs will be responsible for selecting and training drivers and the Ministry has duly informed Local Councils to provide drivers and operators for the training exercise,” he said. President Bio disclosed that the garbage collection assets would be factored into a wider garbage collection and management policy framework that was being developed by his government, adding that the process would take into consideration strong collaborative partnerships with local councils, communities, and MDAs that handle health and the environment with a target of purposeful planning toward meeting sustainable development goals and improving the quality of life for citizens. Chinese Ambassador to Sierra Leone, WU Peng, said the donation by the Chinese Government was not only to support the national cleaning exercise but to also support Sierra Leone’s efforts for a brighter future. He said the trucks would soon appear in Freetown and other areas of the country to work efficiently for the better future of Sierra Leone. He disclosed that since the pronouncement by President Bio of the national cleaning day, there had been a great improvement in the cleanness of Freetown. He said the Chinese Government had made a strong commitment to supporting the country and recalled that during President Bio’s visit to China last year the two countries agreed to further engage in strategic partnership and cooperation to which China was committed. “We are good partners and therefore we will give all the support in our capacity to support the New Direction of President Bio. We will continue to promote more Chinese investments in this country. If we can work very closely in an efficient way, there are some big projects in China that can be delivered to Sierra Leone this year,” he assured. 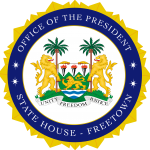 Mayor of the Freetown Municipality, Yvonne Aki-Sawyer, thanked President Bio for introducing the monthly cleaning exercise and for creating the infrastructure which she emphasised had helped to improve the sanitary situation in Freetown. She said that the Councils across the country were very excited about the truck donation, describing it as a major boost to ensuring their localities were cleaned.